Jesus is The Only Way to God How can Christians make such ‘offensive’ and ‘exclusive’ claims? While anyone can claim to be divine, be divinely inspired, or have mystical visions or experiences, only Jesus’ claims were substantiated by both prophecy and miracles. Details of His life were not only foretold many hundreds of years before He was born, but he performed miracles to authenticate His Message, and made quite a few prophecies of His own. The Problem of Evil. The existence of evil is one of the greatest challenges to Christianity. Does evil exist and, if it does, where does it stem from and why doesn't a supposedly all-good & all-powerful God do something about it? Does the Bible say that God created evil? Natural Disasters The sheer scale of many natural calamities and the resulting death, destruction and human misery can not only test the faith of even the firmest believer, but cause many others to question God’s goodness or even His very existence. A Christian who believes in an omnipotent and benevolent God is challenged to go beyond a geological/scientific explanation of disastrous events and explain why God allows disasters like tsunamis to happen. It is doubtful that any answer will be completely emotionally satisfying. Nonetheless there are Biblical answers that not only meet the criteria of reason, but refute most of the banal platitudes peddled by those that apparently speak before they give the matter a modicum of thought. World Peace Atheists claim that the absence of world peace indicates that God does not exist, since it would be obvious that He would grant world peace in request to sincere prayers in this regard. Can God Kill the Innocent? How is it that God could allow the annihilation of thousands and thousands of people, whether that annihilation was through war or natural disaster? In fact, how is it that God could even command such a thing in the Old Testament if it is immoral to take the life of an innocent human being? Thou Shalt Not Kill: Does God Violate His Own Commandment? The Bible confirms that God ordered the killing of thousands of people. Isn't this an open and shut case for the hypocrisy of the God of the Bible? Joshua's Conquest: Was It Justified? How could a good God commission Israel to destroy women and children in battle? Why Did God Allow The Killing Of All The First Born Of Egypt? People who kill other people’s babies deserve to die. Therefore the ancient Egyptians deserved to die. Still, God showed them mercy for years, giving them time to repent. Does Picking Up Sticks Deserve the Death Penalty? In truth, only God could know what would have happened if this man’s disobedience had gone unpunished, and only God could have known what would have happened if that punishment was not the death penalty. Aaron’s Sons - Nadab, Abihu, Eleazar and Ithamar. One of the more inexplicable events in the Bible was when Aaron’s two eldest sons Nadab and Abihu, were struck dead by the Lord because they violated one of the Lord’s very specific instructions. However, the two younger brothers, Eleazar and Ithamar, and very likely Aaron as well, deliberately disobeyed God's instructions, but were not struck down. In fact, God blessed their lives and the lives of their descendants. Why? Why did two perish and two prosper? The Dark Side Of Church History The Crusades, Inquisition, Witch burnings, the Holocaust .. Is Christianity an excuse for brutal, heartless and senseless atrocities? Secularism.. The Most Evil Philosophy Known To Human Government. Hypocrisy In The Church How can Christianity be true...since the church is full of hypocrites? Hell: God’s Torture Chamber? Most Christians believe that the Bible teaches that sinners will suffer eternal punishment in hell. This has led to a considerable amount of difficulty in sharing the faith because most non-Christians believe that a God who would torment people in hell for all eternity is monster worse than Hitler and they, quite understandably, want nothing to do with Him. Since either Heaven or Hell is the final and eternal destination of every one of us, the importance of these two subjects cannot possibly be overstated. In fact, it is imperative that we thoroughly and completely understand, not man's teachings, but what the Bible says about heaven and hell. When it comes to hell, the deeper one delves into the subject, the less persuasive the argument in favor of the traditional view becomes. Children In Hell? What does the Bible say? How much sin can God forgive? 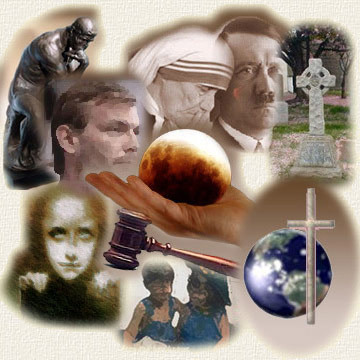 Is God within His rights, as it were, to forgive minimal crimes but not within His just rights to forgive extreme crimes? Hitler and Mother Teresa What kind of God would allow a Hitler to go to heaven if he finally came to believe in Jesus, and a Mother Teresa to go to hell if she didn't? Miracles Impossible violations of the laws of nature? The Bible and Slavery Can we determine with accuracy what the Bible really says on the topic of slavery? Does the Bible condemn it as a social injustice? Does the Bible condone the practice? And how does the Bible's position on slavery mesh with the idea of a loving God? God is a Chauvinist Women in the Bible did little but ‘submit’ to their husbands” ...Nothing could be further from the truth..
Polygamy In The Bible There are a growing number of Christians who believe that Polygamy is an acceptable practice, based on 1) it was practiced by some of the Old Testament patriarchs 2) The Bible does not specifically condemn it, and 3) Because God permits and regulates the practice, He must condone it. However the question that has to concern the New Testament believer is not what Jacob or Elkanah did, but what God’s original design for marriage was. Questions Skeptics Ask Most critics of the Bible assume that because something is unexplained it is unexplainable. When a scientist comes across an anomaly in nature he doesn’t give up on science. How many NASA scientists resigned when they found rings around Jupiter which was contrary to all scientific explanations? When the Bible has been proven to be accurate over and over again in hundreds of details the burden of proof is on the critics, not on the Bible. Evolution Many believe in evolution for the simple reason that they think science has proven it to be a ‘fact’ and, therefore, it must be accepted. Atheism To claim you know there is no God is to claim you have exhaustively searched every part of every universe and dimension with an infallibly accurate method of detecting every non-physical entity that could possibly exist.